Death, resurrection, and change are woven into the narrative of Talkhoon’s personal experiences during her country’s upheaval. Farnoosh Moshiri’s latest novel is set during the 1979 Iranian revolution against its monarchy. 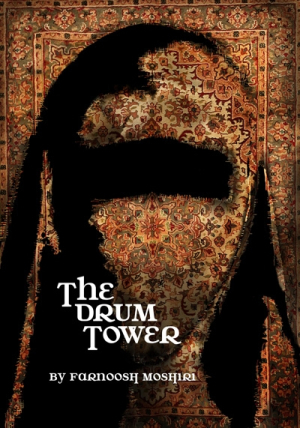 The Drum Tower isn’t a chronicle of the Ayatollah Ruholla Khomeni’s rise to govern the nation through Islam and its laws; instead, it brings Iran’s revolution to life through the eyes of Talkhoon, a young woman whose family fortunes have disintegrated. Moshiri’s choice of a first-person narrative and her well-honed ability to draw in the reader deliver a story that pulls away the curtain from Iran and the main players of history to reveal the revolution’s consequences for one extended family. Talkhoon—daughter of a Marxist whose wife mysteriously left the family, granddaughter to a bullying woman who has time for only Taara, Talkhoon’s beautiful sister—longs for change. Her family life is boring and her Uncle Assad’s unusual attentions scare her. When the revolutionaries begin to take over Tehran, Talkhoon’s home and family are set on the road to ruin, and she tries to escape. On this path, she uncovers her true family history, the ghosts of Drum Tower, and the violent past of her ancestors. From the stagnation of daily life to the family ghosts that wander the house’s halls, Talkhoon struggles to stay sane. She seeks freedom and must learn how to come to terms with abandonment by her mother, father, sister, uncles, and aunts. She sees her extended family as strangers because they all, in one way or another, left her behind. The mythic Simorgh, a bird akin to the phoenix, from Persian and Azeri folklore, symbolizes freedom to Talkhoon. The eventual discovery of her family’s secrets changes Talkhoon’s way of thinking, in effect burning up her prerevolution life. Her emergence out of that fire, and her struggles to reach a metaphorical rebirth, opens her mind to the possibilities of a life of freedom. Moshiri’s tale of the early days of Iran’s Shi’ite-controlled Muslim nation is expertly interwoven with Persian folk beliefs and history. She lets her characters speak for her concerning the revolution against the Shah of Iran. Moshiri’s prose is lyrical and smoothly fluid, and Talkhoon is a memorable heroine. The Drum Tower offers an intimate perspective on a major historical event, as well as finely developed characters, story, pacing, setting, and themes.